This new edition of Managing Change in Organisations by Colin Carnall offers a thorough, practical overview of how to achieve effective organisations. It is ideal for advanced undergraduates, postgraduate and MBA students on courses in managing change and organisational change. A strategic approach is taken throughout, outlining guidance and techniques for planning, implementing and reviewing and taking advantage of major organizational changes. This successful and popular text is particularly valued for the way it combines theory and practice in one volume to provide students with an invaluably comprehensive text. 1. 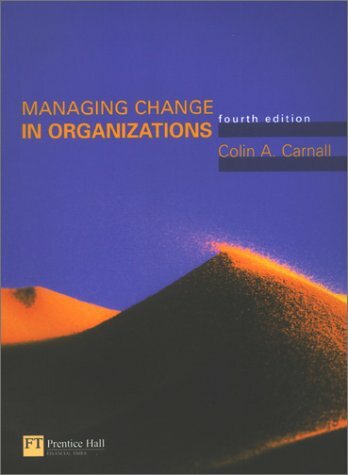 Managing Change in Organizations Carnall, Colin A.